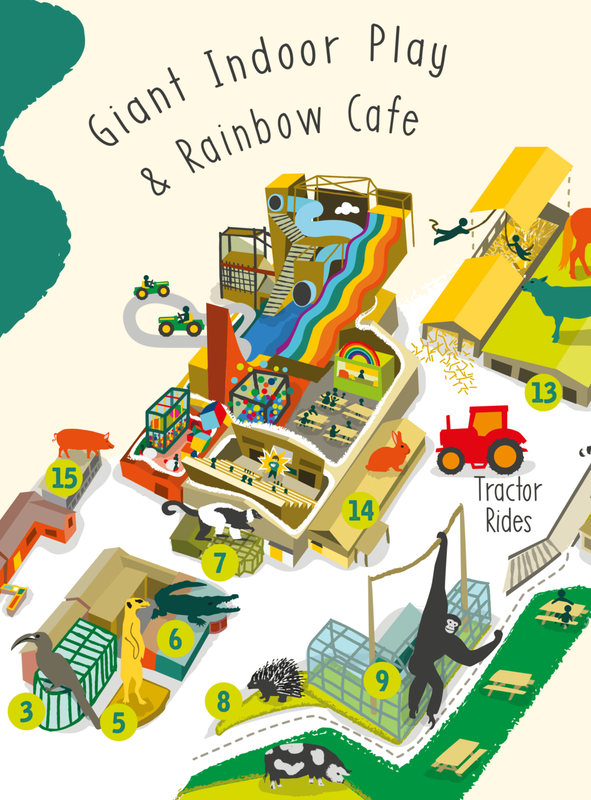 Noah’s Ark Zoo Farm is a national award-winning animal park and education centre based in Wraxall, North Somerset, 6 miles from the centre of Bristol. The spacious 100 acre park is home to over 100 species! From the big zoo animals, including those of international conservation importance - African Elephants, Lions, Tigers, White Rhinos, Giraffes, Zebras - to farm animals that visitors can feed and pet. Within the zoo, there is also a huge indoor Play Barn and multiple outdoor play areas. 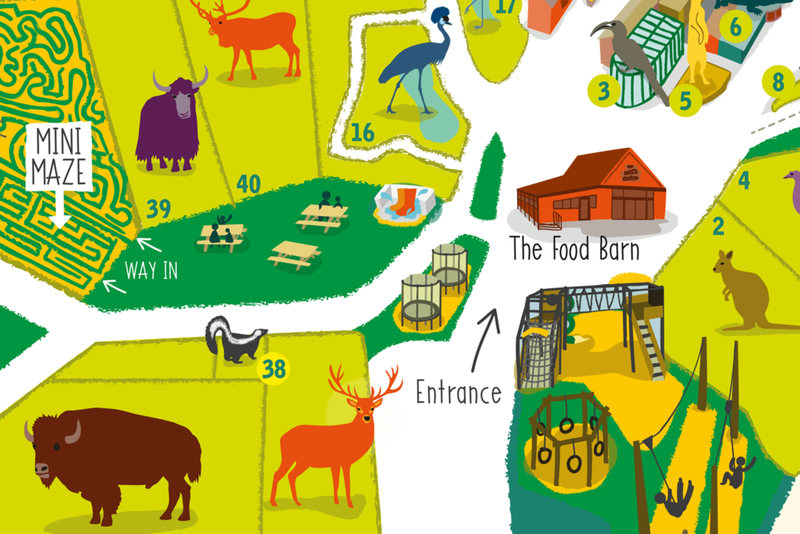 To create an illustrated map of the zoo which would show the many animals and attractions at Noah’s Ark Zoo Farm, as well as be useful for general wayfinding. 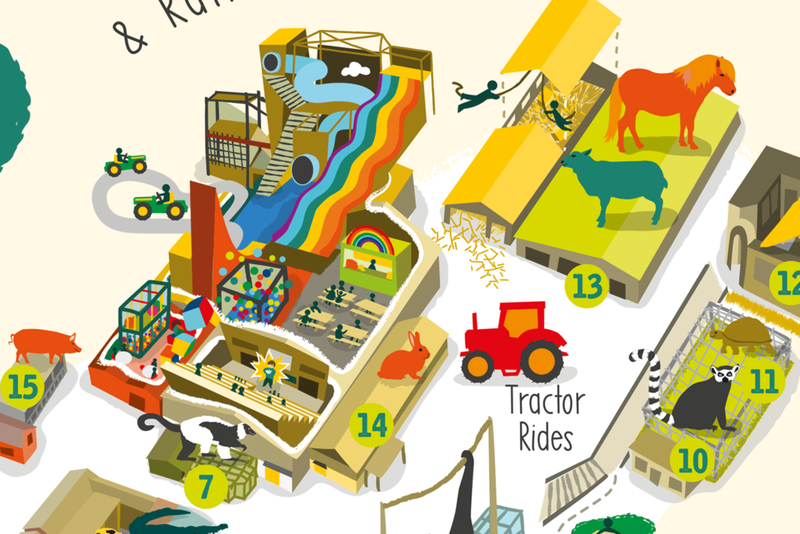 In addition to the locations of all the animal species, the client was keen to indicate specific play areas on the map, some of which are indoors, in a ‘3D style’. The map is to be used on marketing materials and on-site signage. The illustrative style of the map needed to work alongside the client’s existing brand, clean graphic style and colour palette, and appeal to a family audience. The full map - click to enlarge! I used Google Maps as a guide in creating the overall map layout along with reference pictures of the various buildings and animals. Obviously there were a lot of elements to include, so it was important to keep the illustration style relatively simple. 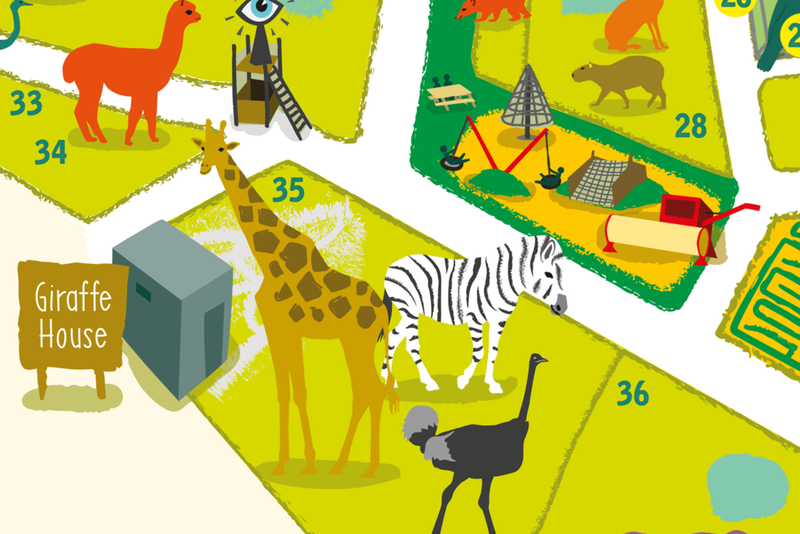 Detail, particularly on the animals, was kept to a minimum, also helping to link the map with existing marketing materials which use animal silhouettes. Pictured below: Marketing leaflet showing the map in context. 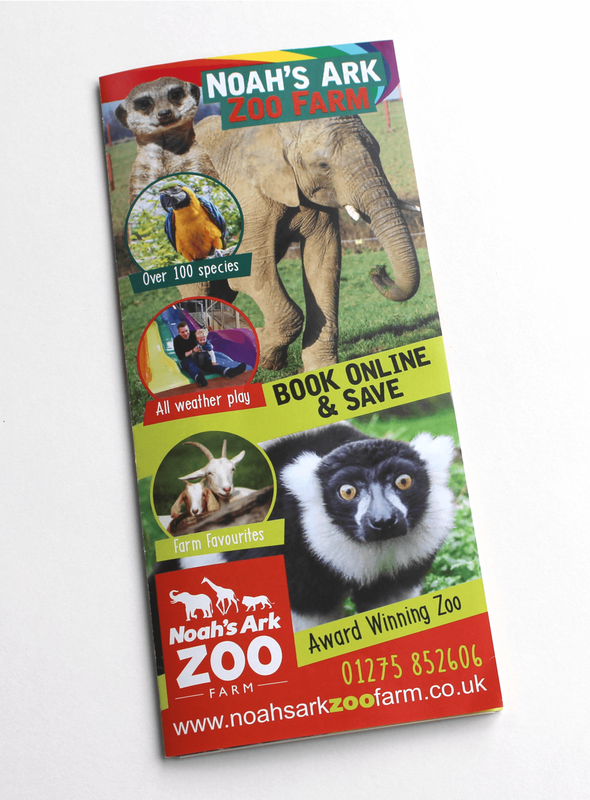 Leaflet design created by the in-house Noah's Ark Zoo designer. Please could you outline the particular project you approached Carys to help with, and what were your key directives in the brief? 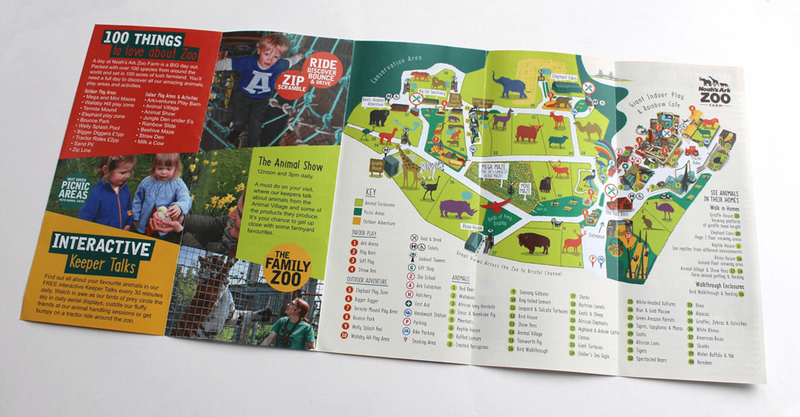 We needed a new map to show how much fun there is to have at Noah's Ark Zoo Farm that included: all the animals locations, key elements in each of the play zones, location of food outlets, shop, toilets, handwashing points and legal requirements such as first aid etc. Did you look at other illustrators who may have been able to deliver this work, and if so, why did you decide to work with Carys? We got quotes from 2 other illustrators. Carys was selected as we felt her style would work with our vision and she represented great value for money. How did you find the process… from the initial briefing through to the completion of the work? Very straightforward. The briefing and quoting process was easy and Carys is very easy to work with. 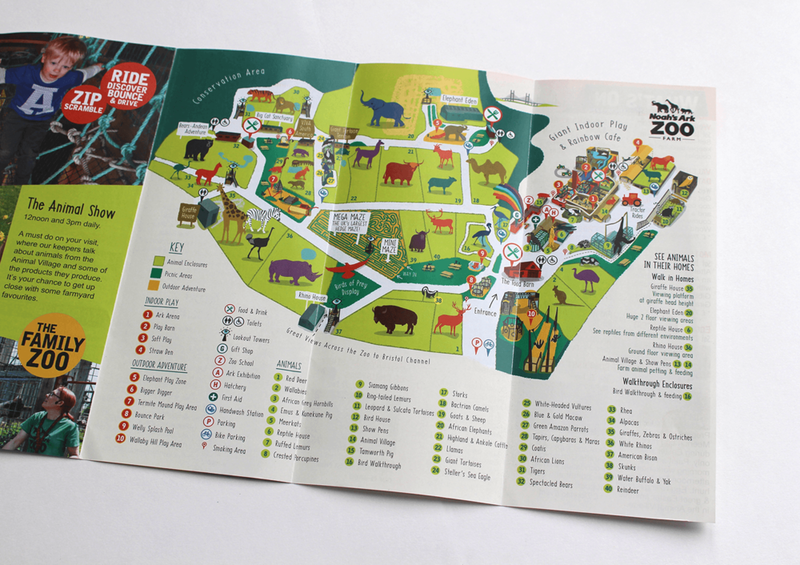 Are you pleased with the finished map, and have you had any feedback yet from potential visitors to the zoo - would it make them want to visit? 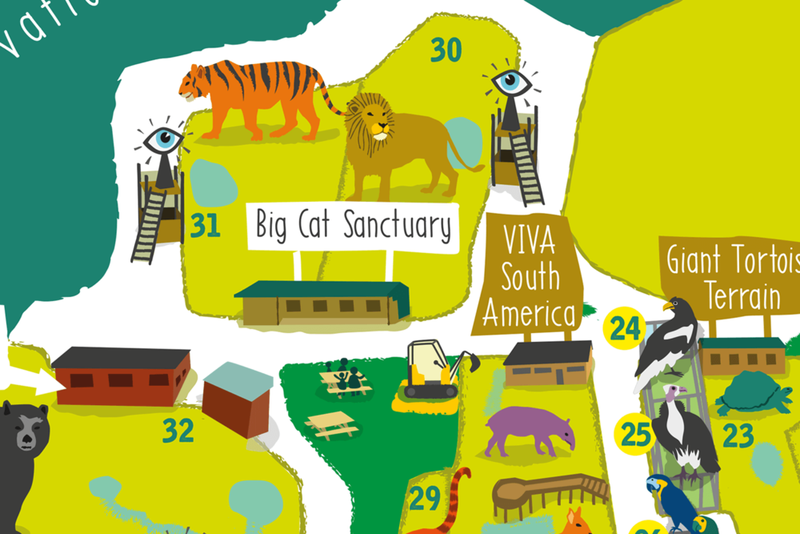 We are delighted with the map, there are surprising little elements of humour that have been injected into the map and the animals have been given character even though they are simple in their design. And finally, if you were to describe Carys to another marketing manager looking to commission illustration for their business/organisation, what would you say? I would definitely recommend Carys. She had a really great understanding of the brief, utilised our brand guidelines and integrated the map into a leaflet designed by our in-house designer. She was prompt and the ultimate professional in all our dealings with her.